Did you know that witches and trick or treating are part of Scandinavian Easter traditions, which are still celebrated in parts of Sweden and other Scandinavian countries? On the Saturday or Thursday before Easter, young children dress up as witches or påskkärringar (the kindly, apple-cheeked, headscarf wearing kind, similar to Italy's la befana, the Christmas witch!) and go door-to-door asking for candy or other treats. How neat is it to have Halloween-like traditions in springtime?! 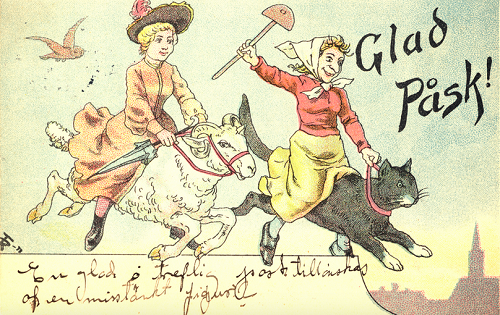 This tradition stems from the old belief that witches were a their most powerful during Easter week and that they would travel to Blåkulla (Blue Mountain) via broom (or even ride stolen livestock like cows, goats, sheep, or even cats - see image below) to cavort with the devil on Maundy Thursday through Saturday. To honor this old belief, Scandinavian children dress up as witches and go trick-or-treating, like Halloween! In some parts of Scandinavia children leave Easter cards or a small token of thanks to the houses they visit. 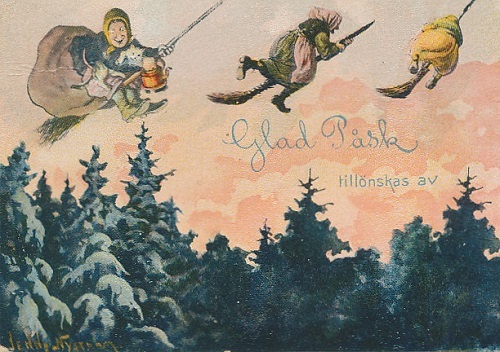 Many of these cards feature images of påskkärringar, or Easter witches. I love how you can find traditions similar to Halloween throughout the year for many different holidays. 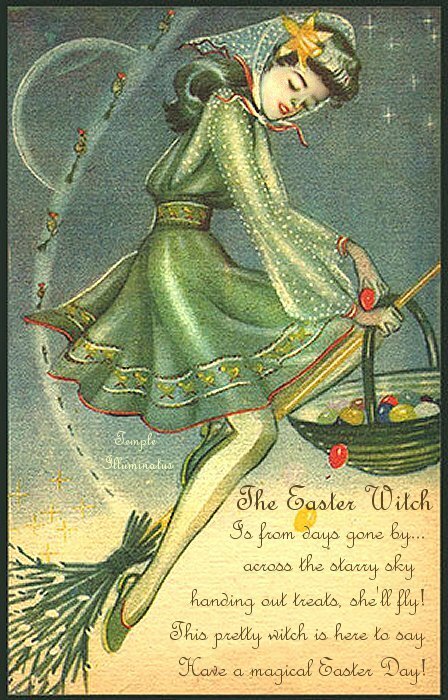 I love the Scandinavian tradition of Easter witches and it is fun to learn about different holiday traditions from around the world that relate to Halloween.